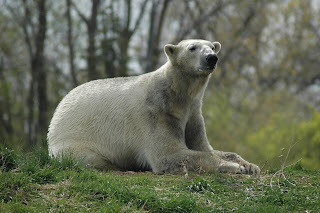 Keeper Blog: News from Polar Bear Country! Well... actually Detroit, but the Detoit Zoo could be considered bear country since they are currently housing Buzz and Neil for us while we build their new exhibit! Buzz and Neil's new keeper just emailed us an update on the boys. They have been out on exhibit and they responded very well to their new surroundings. Buzz temporarily turned himself into a brown bear by rolling around in the dirt! In their new home they can watch the seals swimming next door and see other polar bears from across a mote. We definitely miss them, but it looks like they are adjusting very well to Detroit.